SinclairUK are proud to announce the immediate availability of the first Sinclair QL computer in about a billion years or something, the QL mini. We did intend to launch yesterday but feared that it may be seen as an april fool joke and not an actual real product so delayed for 24 hours. The new Sinclair QL mini is the only computer with comparable specs in it's price range, no other computer comes close and no other computer at any price allows you to do so much with an official Sinclair sticker on the front. 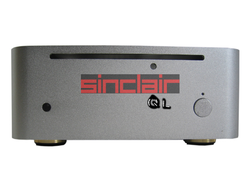 The new QL mini is only available in traditional Sinclair kit form as it reduces the cost to the consumer and to save you even more money we have decided that you would be better off sourcing the parts yourself as it means we don't need to pay for a huge warehouse to store everything, therefore passing the savings on to you. To obtain your new Sinclair QL mini please follow these instructions. 1, Purchase these parts from your favourite vendor. 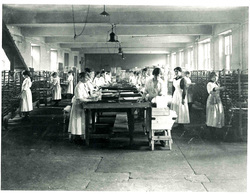 2, Assemble all the parts, training courses should be available in your area if you don't know where to start. 3, Send the receipts for the parts you purchased to SinclairUK so we can verify that your new computer meets the QL standards. Once all these steps are completed, you have affixed the Sinclair sticker to your case (this is the most important part) and installed Sinclair OS you will now be the proud owner of a brand new Sinclair QL mini, the greatest mini desktop computer with a Sinclair badge available today. You will receive a Sinclair UK welcome pack containing warranty information (only covers sticker peeling) and a CD-R disc containing a couple of emulators we downloaded. Why buy a bog standard PC that doesn't say Sinclair on it when you can have a Sinclair QL mini that does. Please see the SinclairOS page to download and be impressed by our fancy sinclair wallpaper. We are pleased to announce the immediate availability of SinclairOS version 1.0 Pink Eye. We have created SinclairOS to be the most configurable and powerful operating system available today for any system, it can be as simple or as complicated as you want it to be, it can do anything you could ever want to do with a computer and many things you have yet to think of. YOU decide how you want it to look, YOU decide what features you need, SinclairOS is the operating system for YOU no matter who YOU are, it's all about YOU the Sinclair User for Your Sinclair and should never Crash. SinclairOS is designed from the ground up to bring back all those memories of typing in listings from books and magazines for your sinclair computer in the best possible way we could think of using today's technology to create the worlds most advanced operating system. Visit http://www.linuxfromscratch.org and follow the instructions to Configure your very own SinclairOS 1.0 Pink Eye for your Sinclair Computer today and if there is something you don't like or think could be improved you can just edit the listings just like you could in the 80s, SinclairOS is amazing. For SinclairOS support please create an online community of fanboys to help with any problems or use answers.yahoo.com as we at sinclairUK really don't know a lot about linux, we are sure that if you use google you may find some useful information. Recreating the Legendary Spectrum, It's back... and better than ever! The new Spectrum is a modern functional PC as close to the original in design as humanly possible. It houses a modern PC motherboard featuring an AMD A4 APU or AMD Phenom X4 CPU and radeon chipset. It comes in the original black color with that rubber key feel you will always remember. The new spectrum starts at just £350 for a bare bones system to add your own hardware. 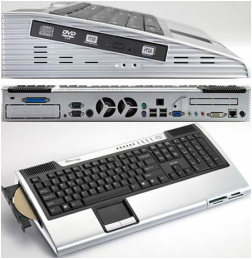 £999 for an AMD A4 APU, 2gb DDR3 RAM, 500gb hard disk and DVD burner to £1699 for a 2.8ghz AMD Phenom CPU, 4gb RAM, 1TB hard disk and a blue ray reader with no eject button but be careful, it will probably over heat, we have no idea how to cool a modern PC. Available for pre-order soon as we only have a render we stole of another site so far. The new ZX80 and ZX81 keyboard computers, there is really a whole computer in there. 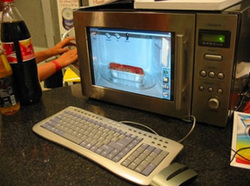 Sinclair was always famous for their space efficient computer keyboard designs, but with ZX series we've taken it to a whole new level. 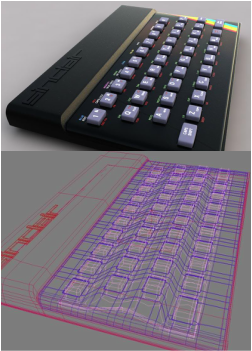 The ZX80 and ZX81 have an ergonomic design providing a great feel and typing angle which is a delight to use. It is also tough and sturdy with impact resistant key caps that have been stress tested to withstand more than a million key strokes, just don't spill anything on it. The range will start at just £1299 and will be available soon (unless we change our minds and do something completely different) but you can buy them from the manufacturer in china already and for less than we will sell them for but then you won't get a Sinclair badge on it. The original QL was a very powerful system for it's time so it's only right that our new range of QL systems will use the best hardware available today. The QL will start at £2000 and rise to £20000 for the top end workstation and all will run our own Sinclair OS, don't be fooled by similar specification computers from big manufactures for less money, they don't have a Sinclair badge and don't run Sinclair OS only regular Ubuntu without the bits we removed and changed a bit and you will have to download your own emulators for those, we save you the time. More details will be released as we dream them up, we may decide that they're HTPCs that look like microwaves. Here you can see our factory in China producing new Sinclair computers to the highest standards using the most up to date manufacturing processes available today. Not long now until you can have your very own Sinclair computer on your desk and this is seemingly the proof despite the fact that it's clearly not what we claim.